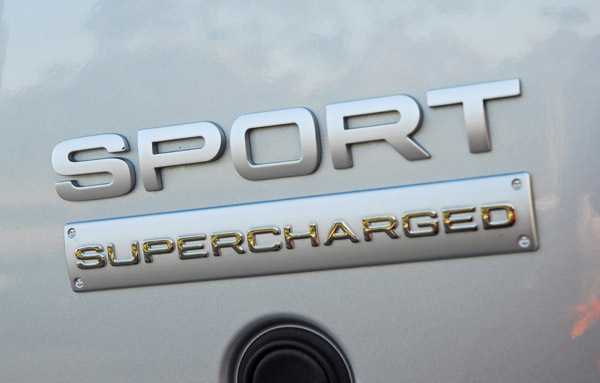 The new 2010 Range Rover Sport Supercharged is Land Rover’s ‘sports tourer’ model. Significant improvements were made to the exterior design, the powertrain, chassis, and interior including cutting-edge improvements to interior refinement and safety. This is the first Range Rover that I have tested and I am so impressed with the power, performance and elegant interior that I really don’t want to shut down the engine. 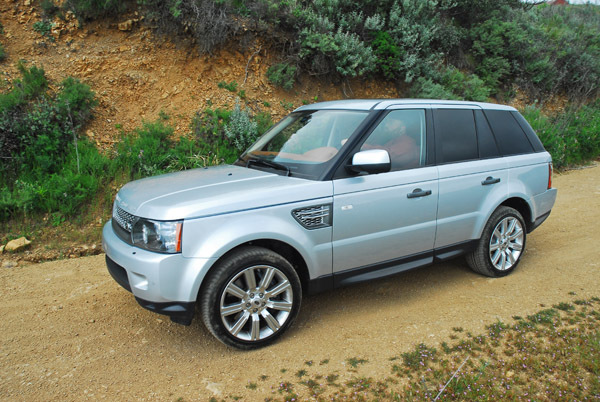 The new 2010 Ranger Rover Supercharged Sport reaffirms its status as the most exciting and dynamic member of the Land Rover range with a comprehensive package of engineering and design changes. The vehicle’s stylish new appearance signals the transformation under the skin, which includes the new 5.0 liter Direct Injection DOHC Supercharged V8, enhanced levels of interior craftsmanship and refinement, and significant improvements to both on-road and off-road driving dynamics. The introduction of new systems such as Adaptive Dynamics working with the existing Dynamic Response system and the addition of the road-focused Dynamic program to the Terrain Response system help enhance agility and ride quality. Further improvements to the Terrain Response system ensure that off-road capability is kept at the expected class-leading level. The Range Rover Supercharged Sport’s stylish, muscular exterior has been updated to emphasis its position as the most dynamic model in the Land Rover range, creating a sporting, cleaner and more sculpted appearance. At the front, new signature LED headlamps provide a technical focal point, and feature Range Rover inspired interlocking circle lamps. With a new two-bar grille and larger air intake, the vehicle’s frontal graphic is much more slim, athletic and low-slung. The new front bumper blends with redesigned front fenders to form a simple, sculpted surface, offering improved aerodynamics and a lower, more sporting visual stance. The side view features new two-stripe LED indicators, along with redesigned tow-section fender vents. Color coded door side mirrors complete the visual changes. At the rear, Range Rover inspired light cluster create a fresh new look, while the smooth and sculpted bumper design mirrors the style of the front end. The rear glass flips up and makes loading and unloading small pieces of cargo quick and easy. Just close the glass and push the black button on the lower right side and the full hatch opens to load or unload larger cargo items. The rear also shows the Sport and Supercharged badges. Just below the bumper are two, 3in. polished stainless steel exhaust tips. New front wheel deflectors help reduce drag and new 20X9.5in. wheels and tires optimize stability, traction, rolling resistance and improved tire wear. 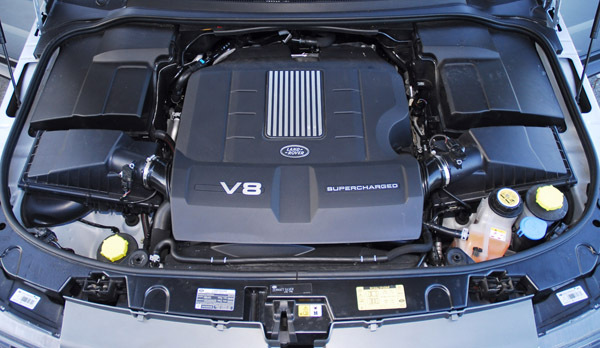 Powering the Range Rover Supercharged Sport is a new 5.0 liter which was designed by the Jaguar Land Rover powertrain team using an impressive collection of state-of-the-art technologies. They were developed with an emphasis on delivering a smooth, refined and responsive performance without a corresponding increase in fuel consumption. The new supercharged version has 29% more power and 12% more torque than the previous 4.2 liter powerplant. It now pumps out a class-leading 510hp at 6,000-6,500rpmm and 461lb.ft. of torque at 2,500-5,500rpm, to all four-wheels. It benefits form an ‘industry first’ multi-hole central spray-guided direct injection that is highly efficient, a torque-actuated variable camshaft timing on all four cams, camshaft profile switching and variable-length inlet manifold that optimizes power and torque, a reverse cooling that further improves engine efficiency and speeds cabin warm-up, a class-leading, low-friction design, lightweight construction using recycled materials and 15,000 mile service intervals. A six-generation Eaton twin vortex system supercharger is fitted. It is a compact Roots-type unit feeding air through twin intercoolers which in turn are water-cooled by their own cooling circuit. The high helix rotor design both improves supercharger thermodynamic efficiency by 16% and also improves noise quality to the point where the unit is now almost inaudible. The intercoolers reduce the temperature of the pressurized intake-air, and so optimizes power. The air intake has been radically redesigned compared to the previous V8. The intake air path is a direct feed to the supercharger inlet from the centrally mounted front throttle body. Air is delivered through twin air boxes which reduce flow loss and further increase efficiency. Mechanically, the new supercharger and its intercoolers are efficiently packaged in the V of the engine to deliver a lower overall engine height. I was amazed at how easy it was to accelerate when I gently touched the throttle. I had to maintain a good distance behind the vehicle in front in traffic so I would overtake it when traffic moved, and that was when I didn’t even have the supercharger engaged yet. This powerful supercharged engine is mated to the revised and super-smooth ZF HP28 6-speed automatic transmission. It characteristics have been optimized by Land Rover engineers to provide class-leading response, with rapid and refined shifts. The dramatic enhancement of both power and torque low down the rev range on the new supercharged engine have made it possible to actuate the transmission’s lock-up clutch much earlier in each gear, reducing slip through the hydraulic torque converter, so helping with improvement in both fuel consumption and CO2 emissions. The transmission features an intelligent sport mode, which can sense and adapt transmission characteristics to particular driving styles. For the first time on a Range Rover Supercharged Sport, you can change gears manually with steering mounted paddle-shifters, just like in a refined luxury sport sedan. 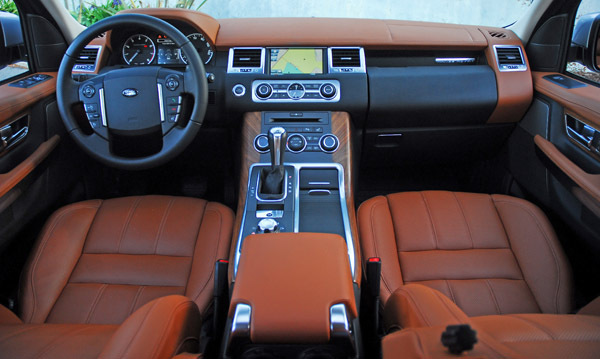 The 2010 Range Rover Supercharged Sport’s award-winning Terrain Response system, conveniently mounted on the center console and controlled by an aluminum and rubber insert wheel, gains new features and refinements, further extending the vehicle’s all-terrain capability. Most significantly, the Terrain Response system now includes a new ‘Dynamic’ program designed for sporting on-road driving as mentioned above. The system is quick to respond to your inputs. When you select the new Dynamic program, the Terrain Response system tailors the vehicle’s chassis and powertrain settings to deliver a more sporting and responsive driving experience. Tighter body control and quicker steering response are achieved by adjustments to the Adaptive Dynamics system, while the accelerator pedal mapping, dynamic stability control system and gear-change setting are also given more sporting characteristics. Like I said earlier, you feel like you are behind the wheel of a sport luxury sedan, not a heavy, lifted sport utility vehicle. The Dynamic program has also been specially tuned to take advantage of chassis changes like 20% stiffer rear roll control bar, and further revisions to the steering system, suspension bushings and alignment settings. For soft sand-one of the most power-hungry surfaces-‘sand launch control’ has now been introduced, which makes for noticeably easier drive-away. New speed-dependent wheel-slip targets for the traction control system permit only very limited initial wheel-slip, helping to prevent the wheels digging down into the sand. 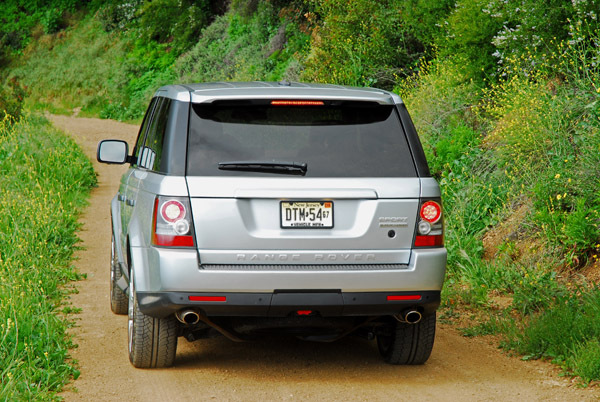 New for Range Rover Sport, revisions to the rock crawl program improves brake and traction control response times, helping to reduce the vehicle’s wheels rolling in an unintended direction when traversing boulders, and giving a more composed drive through rocky terrain. 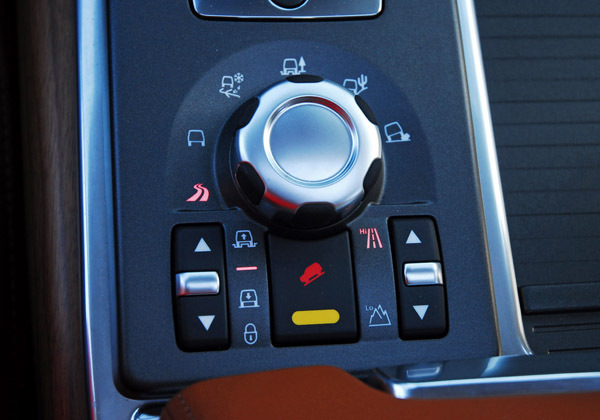 Land Rover’s much acclaimed Hill Descent Control system is enhanced on the latest Range Rover Sport with the addition of Gradient Release Control. This inhibits the initial rate of acceleration when descending very steep inclines, to increase control when braking is released at extreme angles. The new Range Rover Supercharged Sport goes anywhere, anytime, with confidence of success on any trail you can find. The unique suspension features electronic air coil springs with automatic load-leveling and multiple modes: access, standard, off-road and extended height. 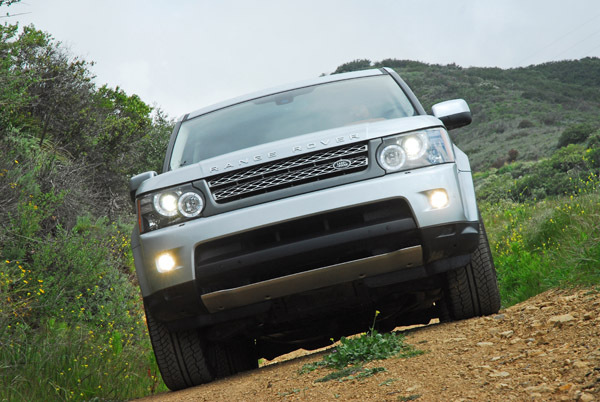 Terrain sensing software and cross-link valving for improved off-road performance. Up front is a MacPherson strut setup with double-lower control arms, long-travel variable-rate air springs that are computer-controlled’ gas-filled shock absorbers, anti-roll bar with 7.6in. of vertical travel. The rear is a double-wishbone setup with long-travel variable-rate air springs that are computer controlled with cross-link valving, gas-filled shocks, and 11.5 in. of vertical travel. The ride is smooth, responsive and controlled at speed or when cornering on-road, and incredibly responsive and comfortable when challenging the toughest off-road trails and obstacles. It’s just amazing how it handles both types of road surfaces. Quickly and safely slowing the new 2010 Range Rover Supercharged Sport down from speed on-road or off-road are new massive brakes. It has been comprehensively updated to provide enhanced stopping power and improved linear feel. The braking system has been developed in conjunction with performance brake specialists Brembo. This system employs giant 15in. ventilated front discs with unique lightweight aluminum six-piston opposed monoblock calipers. The rear features 14.3in. ventilated discs with single-piston sliding calipers. Models fitted with the Adaptive Cruise Control option also benefit from a new Advanced Emergency Brake Assist system, which is designed to detect your responses to a potential emergency situation. Working in conjunction with the Forward Alert System’s radar, Advanced Emergency Brake Assist primes the Sport’s braking system, and even initiates braking in extreme circumstances if a collision is judged possible. Valuable improvements in braking distances have been recorded in the testing of this system. Furthermore, a refinement to the dynamic stability control system helps automatically slow the vehicle if taking a corner too fast, thus enhancing your control. The system operates according to steering inputs from you. In extreme cases, automatic braking intervenes to help reduce the vehicle speed, with the braking pressure level applied according to the steering inputs. This feature is complemented by the new Roll Stability Control system, which is designed to intervene in the unlikely case of an extreme situation in which the possible onset of rollover is detected. In such situations, the system is designed to take over and perform very rapid, wheel specific braking, to help reduce speed and marginally widen the cornering radius. In more extreme cases the system is designed to initiate marginal understeer by sharply increasing brake force on the outer wheels, again widening the turning radius. The new 2010 Range Rover Supercharged Sport is amazing on the outside and under the skin and it all comes together on the inside with a comprehensively redesign with features significantly improved in standards of quality and workmanship, the height of English quality and workmanship. The doors open wide to reveal a cabin that retains its popular cockpit feel but incorporates higher quality materials, sumptuous soft-touch finishes and superb detailing throughout the interior. 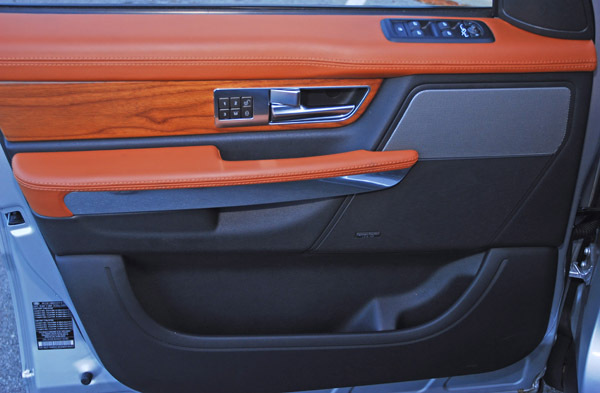 Leather is used extensively on major surfaces plus you find real aluminum trim pieces surrounding the air vents, shift gate and all of the switches and dials that also feature rubber inserts to ensure that you can easily grip the control. To create a more sporting feel, rich dark shades ‘sandwich’ narrow sections in lighter tones, and the effect is completed by a generous selection of stylish wood finishes on the center console and doors. The soft-touch fascia is all new, with smooth and clean-looking design that can be wrapped in stitched, premium grade European leather. It features an architectural beam that runs across the width of the cabin, supported by natural wood finish pillars. The instrument cluster is easy to see and understand with a large, aluminum bezel speedometer and tachometer with a new 5in. Thin Film Transistor (TFT) driver information screen with standard readouts of fuel on board and engine coolant temperature. The signature roller-shutter cupholders covers is now finished in a high-quality metallic sheen. There are new seats front and rear, which feature a deeper, more sculpted shape; electrically adjustable side bolsters are available on the front seats for the first time. New ambient lighting adds to the premium qualities of the cabin, with the introduction of white LEDs to cast subtle halos around interior door handles and pockets, as well as on the fascia and center console. Standard equipment in the supercharged Sport not mentioned above includes heated front/rear seats, heated front windshield with heated washers jets, adaptive front HID headlamps, foglamps, dual zone automatic climate control, power windows express up/down and power automatic door locks, leather wrapped power tilt/telescopic steering wheel, electronic cruise control, memory driver’s seat, power adjustable heated door mirrors with powerfold function, power tilt/slide sunroof, 10-way power adjustable leather sport front bucket seats, self-dimming rearview mirror, trip computer and message center, footwall lights and door mirror puddle lamps, front illuminated vanity mirrors, center console cool box, grab handles above each door, dual map lamps, an incredible 460-watt, 14-speaker Harman/Karman LOGIC 7 surround sound AM-FM-CD audio system, rear seat pull-down armrest, pull-out dual cupholders behind the center console, security pull-out shade for the rear cargo hold, thick cut-pile carpeting with front/rear floor mats, and rain-sensing, variable-rate wipers. The interior is the most luxurious and comfortable that I have ever tested. I felt let down every time I had to park and leave the Range Rover Sport. A new hard-drive navigation system provides faster route calculation and improved system reliability. 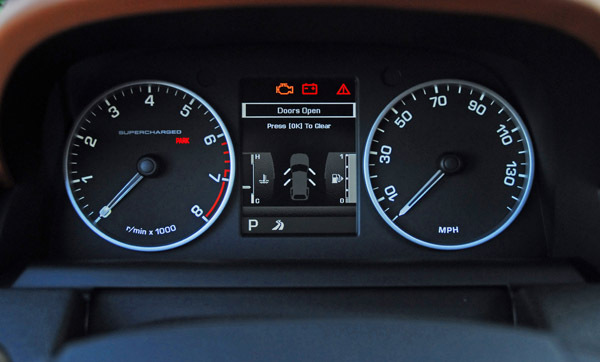 The navigation system adopts an easy-to-use navigation structure which now also features ‘towards guidance’. This supplements the junction map and icon-based information with details of the actual road signage viewed by the driver along the route. The new portable Audio Interface allows connectivity to an array of personal audio storage devices, USB sticks and MP3 players, enabling the various devices’ functions to be accessed and controlled via the fascia-mounted touch screen system. 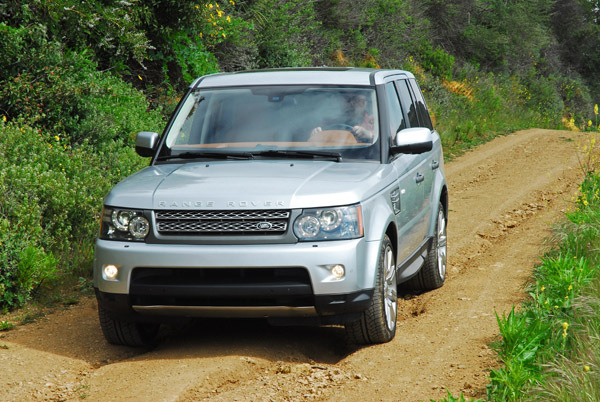 One of the connectivity ports is a dedicated iPod point made exclusively by Land Rover for continued functionality in extreme driving conditions, by helping to prevent the device coming loose from the socket. Options include adaptive cruise control, rear differential lock, rear seat entertainment system with 6-DVD player and 2-headrest displays, wireless remote headphone and remote operation, and a 5-camera 360-degree exterior view system (industry first). Safety systems include 3-point safety belts for all seats with front load limiter/pretensioners, 9-airbags-front/side airbags and head curtains for the driver/front passenger, side thorax airbags for front seats, head curtain airbags for rear passengers, side door impact beams, height adjustable front seatbelts, child locks, Anchors for child seats, rear foglamps, rear park sensors, and front/rear crush zones. 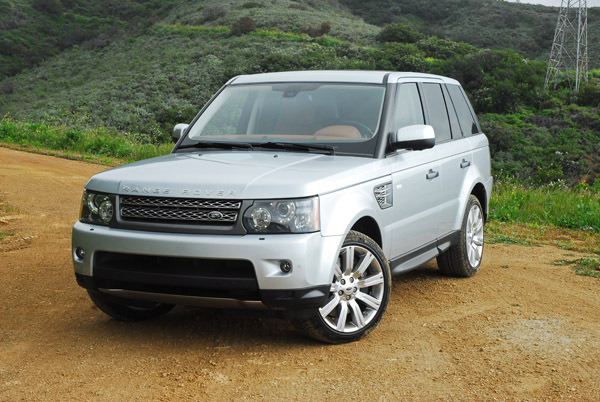 The new 2010 Range Rover Supercharged Sport puts all other sport utility vehicles in a lower level. It has segment leading power, performance, off-road capability, luxury, comfort, convenience, high-tech creature comforts and safety systems above anything else that the competition in the luxury, full-size sport utility segment can bring to the table. It is outstanding to drive and truly enjoyable doing so, no matter the road surface! Front Shoulder Room: 58.7 in. Rear Head Room: 38.4 in. Front Leg Room: 42.4 in. Rear Leg Room: 37.6 in. 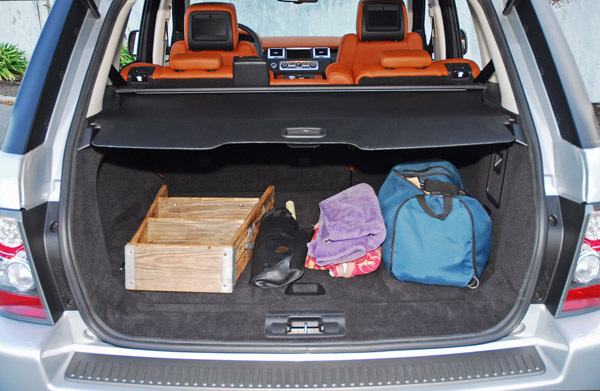 Maximum Cargo Capacity: 71 cu. ft. Maximum Towing Capacity: 7716 lbs. Automatic: 279.6 mi. / 396.1 mi. / 326.2 mi.